The mastering version of the Manley Massive Passive Stereo EQ provides precisely repeatable settings. Manley came up with a clever way to pull it off without breaking your bank account: mechanically detented knobs for the Gain and Bandwidth controls to ensure repeatability-which is what everyone wanted, but without the incredible cost and space problems that tons of Grayhill switches would have caused. The Manley Massive Passive is a passive design and not a "true parametric". A true parametric implies non-interacting controls. In the Massive Passive, the "GAIN" and "BANDWIDTH" controls DO interact (on purpose). It is not possible to create a "GAIN" switch that is set up for "consistent" 1/2 dB steps. When you change the "BANDWIDTH" the step size must and will change. On the regular version, you get a full 20dB boost or cut only when: the bandwidth is fully clockwise (narrow) in bell mode or fully counter-clockwise in shelf mode. Here on the Mastering Version, this maximum boost or cut is 11dB. Conversely at the widest bell, the maximum boost or cut is 6dB and the narrowest shelf maxes out at 12dB. A similar situation is also true for the bandwidth detents. So in this new Mastering Version, do not expect a certain dB change-per-step as it will vary according to where the bandwidth is set. But whatever the step sizes are, they will be a repeatable 16 steps. The FREQUENCY select is already detented and always has been a Grayhill switch. It also interacts in shelf mode. On a similar note, the Manley Massive Passive is a "parallel design" and not the conventional "series design". This means the bands interact with each other too. It is possible, to set a band to boost 20 dB but if another band is boosting near or at that frequency, very little will happen. On a conventional EQ the two bands "add" and you would be boosting 40 dB into clipping. Because the bands interact, predictable step sizes are unrealistic, however, with the Mastering Version, you will be able to repeat settings (if you log them of course). The price paid for interacting bands, is a better sounding EQ and bizarre looking settings (on purpose). Unlike virtually every other EQ, the Massive Passive Equalizer allows much more EQ without sounding "processed". Where 5- or 6dB is about all one could attempt with other EQs in mastering, the Massivo amazes engineers with how much EQ they can do and get more natural results at the same time. 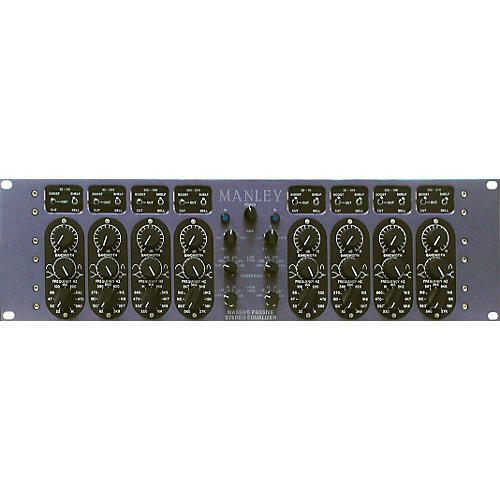 Manley could have squeezed 11-position Grayhill switches in the modules if they had wanted 1/2dB steps, but then the maximum range would have become only 5-1/2dB. The minimum range would then become about 1-1/2dB with approximately 0.2dB steps. This approach would have essentially thrown away most of the useful range the unit is capable of. Going with these special mechanically detented knobs, which use the same pots underneath that the normal Massivo uses, you get nearly all the range of the normal version, but with the added benefit of repeatability made possible by the detents. With mastering engineers in mind, Manley has custom-tailored the FILTERS in this Mastering Version, moving them lower and higher than the normal version. This was done specifically for mastering purposes. If you're looking for drastic effects (like telephone sounds) then get the normal version. These filters are specifically geared for mastering engineers. Additionally, the Master Gain Trim controls in the Manley Mastering EQ are true 11-position 1/2dB stepped Grayhill switches, set up for a range between -2.5 to +2.5 dBof master gain trim. This allows more confidence in left/right matching and calibration. The Filters - 5 frequencies Hi Pass and bypass, PLUS 5 frequencies Lo Pass with bypass. The filters are somewhat better tuned specifically for mastering. (They are flatter until the knee). As with the standard version the slopes are typically 18dB per octave, on these mastering filters except for the highest (52K) at 30 dB/octave.